With new and innovative technologies available on the market, Shared Service Centers are confronted with the need to adapt their way of operating. This article highlights current trends of Shared Service Centers regarding process excellence, innovative technologies, value-added service portfolio and a skilled workforce. While the aim of delivering cost effective, high-quality processes will still be valid for Shared Service Centers (SSC) in the future, the way SSCs operate to deliver these processes is changing. In this article we want to shed light on current trends SSC organizations experience to stay competitive in the fast-changing environment. Looking at current SSC processes, due to the often-used lift and shift approaches, many organizations are still confronted nowadays with non-standardized, paper-based, manual processes. Since processes are the basis for implementing new and innovative technologies, it is no surprise that SSC organizations currently stress the topic of process excellence to foster process standardization and process efficiency. First, comprehensive end-to-end process ownership is needed outside of the SSC organization to define the overall activity split of end-to-end processes between different functions. Second, SSC process ownership is needed to detail processes within the SSC as well as to drive continuous improvement initiatives. Only with a clear mandate and decision-making power, effective process management is possible. Furthermore, close cooperation with counterparts on the IT side is crucial to accelerate the implementation. The second trend that has gained on popularity over the last years are new and innovative technologies such as Process Mining, Robotics Process Automation (RPA) and Artificial Intelligence (AI). While in the old days many companies considered outsourcing options to take advantage of best-in class service providers with innovative technologies, companies nowadays rather start to invest themselves into these technologies. SSC organizations are currently increasing the productivity and quality of their services by using Data Analytics solutions, such as Process Mining. Process Mining enables SSC organizations to visualize and reconstruct processes based on raw system data to reach transparency in processes. This transparency allows them to correct process inefficiencies and bottlenecks. Furthermore, it also supports SSCs to identify potential for process automation. RPA solutions are changing the positioning and productivity of SSC organizations by automating suitable process parts. Processes have potential for automation if they are rule-based, repetitive, have a structured, machine readable input and are carried out manually. As automation moves into SSC processes, a significant amount of administrative human work can be eliminated. Furthermore, RPA solutions accelerate processes and ensure consistent quality. It can be used as optimization lever by all SSC organizations, no matter of the maturity level. Even SSCs with already highly standardized processes can further optimize by automating parts of their processes. In fact, for the future, we strongly believe that RPA will become an essential core capability of SSC organizations. To find out more about RPA potential in SSC processes. Next to Data Analytics and RPA, the future is predicted to be around AI – the concept of continuous machine learning. AI offers the ability for software to learn and program itself – therefore, software with a continuous improvement mindset. An example, that has great value for SSC organizations, are chatbots as well as voicebots. They can be used by SSCs as a communication channel to provide general information, answer specific questions or trigger pre-defined workflows. While communicating with clients, bots continuously extend their knowledge and thus grow their competencies to better support clients day by day. When integrating these new technologies into the operating model of SSCs, also other aspects besides the operating model, such as performance metrics, need to be adjusted. While in the past, most SSC metrics were focused on cost, productivity and quality, new metrics such as “work absorbed through RPA solutions” will gain in popularity in the future. With RPA becoming a core capability of SSCs soon, most administrative activities will be handled by robots. As a consequence, remaining FTEs within the SSCs can focus on more knowledge-intensive tasks instead. 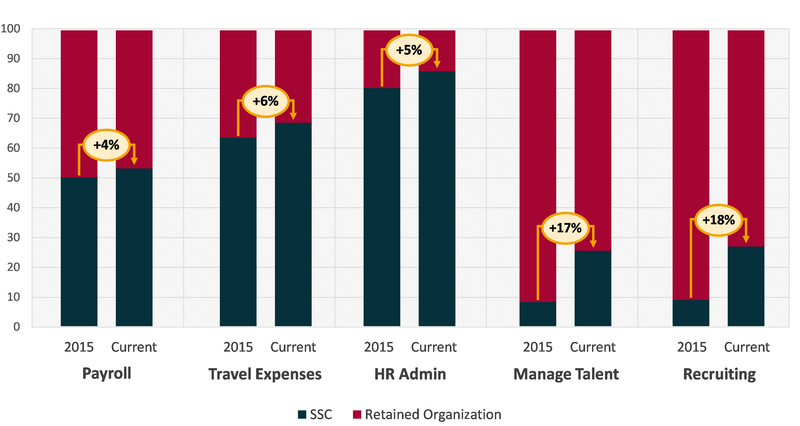 In the HR context, for example, SSCs were typically responsible for Payroll, Travel Expenses and HR Administration. For these processes, as shown in the figure below, SSCs could take over a large spectrum of administrative tasks. Recent trends have shown however that HR SSCs start to take over more Recruiting and Talent Management processes to provide advanced customer experiences. According to Capgemini’s observation, especially mature SSC organizations have the capabilities to extend their service portfolio towards value-added services, since they have reached a certain level of routine. A hybrid sourcing approach supports this trend even further. Immature SSC organizations, on the other hand, initially often focus on transactional processes instead to ramp up their service delivery. 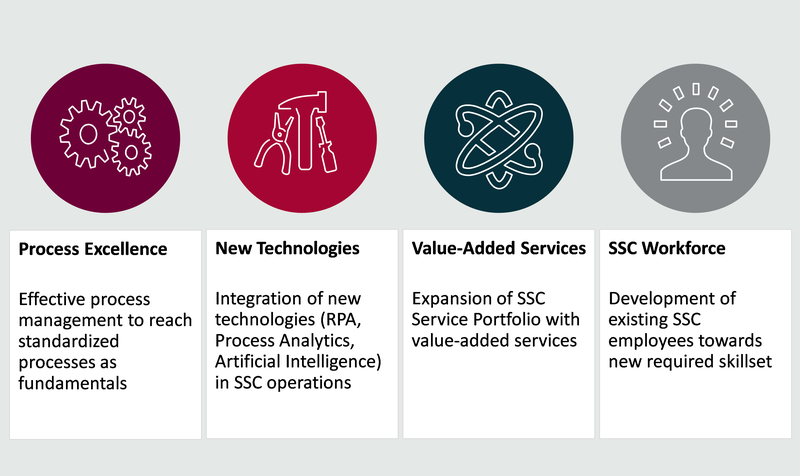 Process excellence, new technologies and value-added service portfolios are prominent trends that influence the way SSCs will work in the future. However, to make all these changes happen, SSC organizations are dependent on the right people. Until now, SSCs often aimed for hiring generalists that have the competencies to perform a wide range of repetitive transactional processes. But times have changed. For the future, a new set of skills will be required. For strategic positions within the SSC, skills regarding process excellence, automation and data analytics become highly relevant. For operative positions within the SSC, skills to perform new value-added activities are needed. Therefore, development opportunities should be offered within the SSC early in the transition phase to upskill existing employees. How to experience RPA best? Create a prototype instead discussing PowerPoint! This article was written by Julia Hansen.